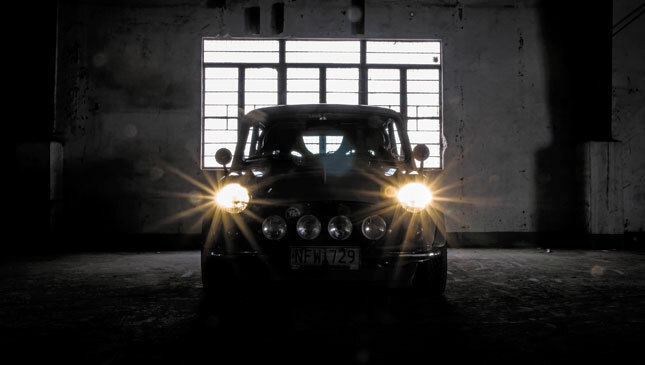 This 1964 Mini is known as Makino-chan, and it is one of the poster cars of Jeiven Perez’s Sushi Factory. The other, a very slick first-generation Toyota Celica, was already featured in this magazine not too long ago. 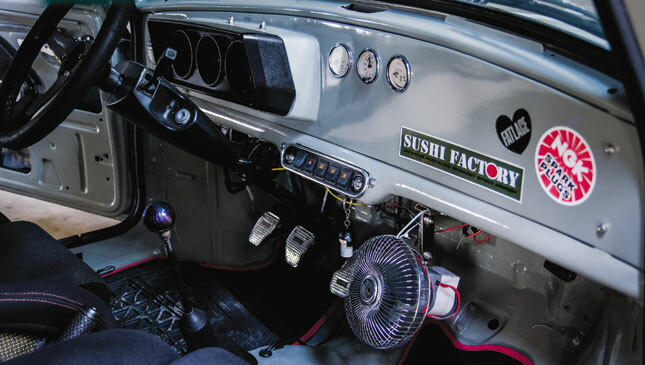 Both cars represent what Sushi Factory is all about, and are the tangible results of Jeiven’s unique vision. A word of caution to the purists: Don’t set foot in Sushi Factory unless you are ready to be shocked. You probably won’t dig the kind of modifications done here. But for those with an open mind, this is the talyer where your imagination can run free. 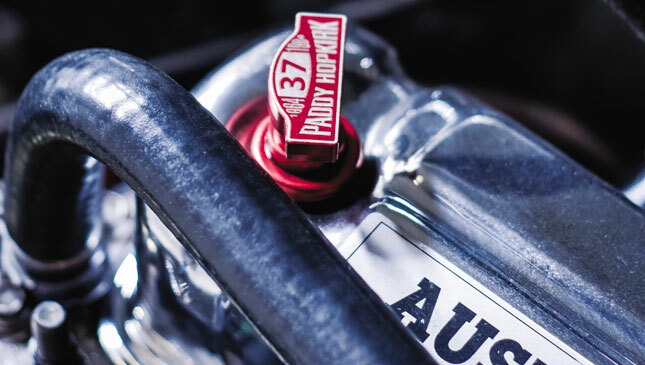 It has a playful DIY spirit that leads to some very unique creations. Jeiven and his crew don’t care about what the purists have to say, and that’s why all of Sushi Factory’s projects are special. Custom flares, spoilers and wings are the first things you notice, but Jeiven’s builds have a spirit and attitude unlike any other. In fact, his garage has found an audience in Japan—he ships Sushi Factory brand parts there now. How cool is that? 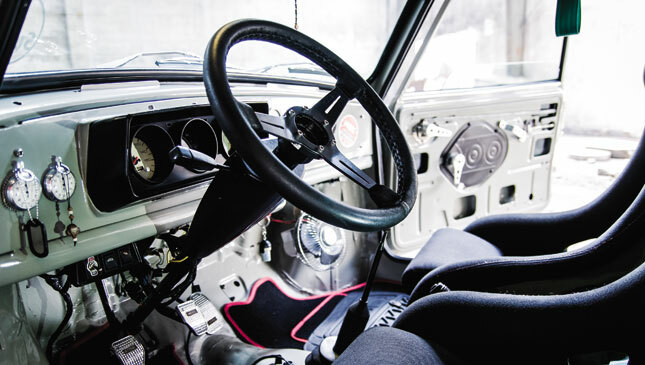 The Osaka car scene was what inspired Jeiven’s projects in the first place. It is quite an achievement to be sending custom-made wings and spoilers to those street-racer groups that have made the subculture so fascinating to outsiders like us. Anyway, back to the car. 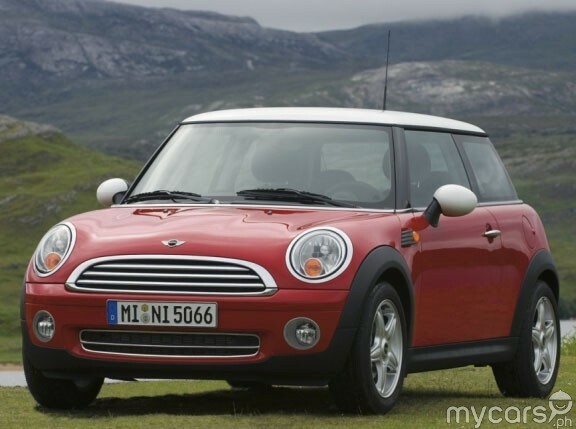 There’s something about this Mini that will keep you guessing. Strangely, Makino looks very stock, but also very Japanese at the same time. It’s really hard to wrap your head around it, so some explanation is in order. 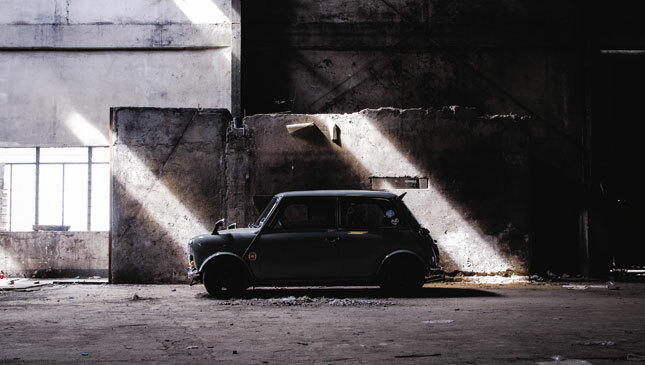 “Somewhere along the way, it was forgotten that Minis were made to be personalized,” says Jeiven. 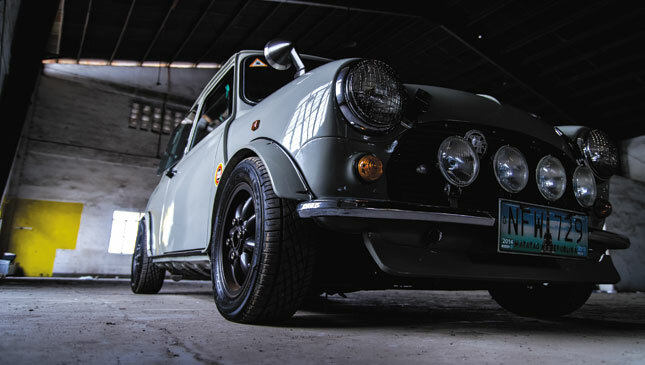 “But you know how it is with many purists—it isn’t accepted by them when you build something with a classic car, although Minis were meant to be modified throughout the years.” This makes his car, a 1964 model with modern Rover parts, fit right in with our Old School section theme. 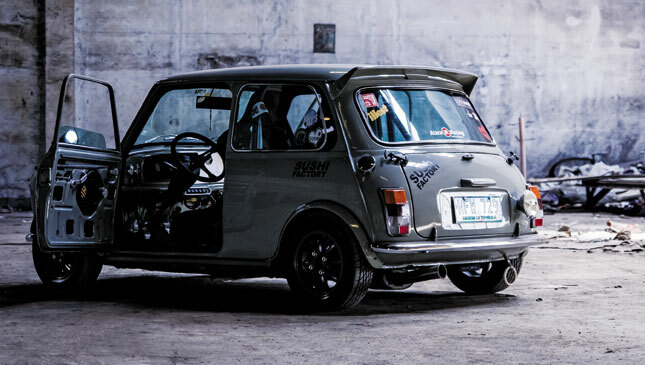 “Actually, it is a 1996 Rover Mini chassis with a 1964 drivetrain,” he adds. Now, here’s the twist: It has more British parts on it, and yet it looks every inch a Japanese ride. The specs list reads like that of Minis from the same period. It has leather belt straps that hold the hood down, a very nice set of foglamps, and subtle fender flares all around. 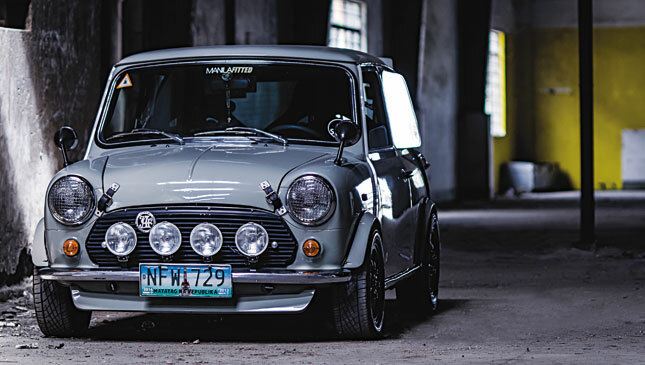 All British parts specially made for the Mini and which you don’t often see on Japanese models, in other words. Jeiven, however, wanted a Japanese look for Makino so that it wouldn’t feel too out of place in the shop. “The goal wasn’t to make it that wild, like the Japanese do with their Minis,” he explains. The influence is hard to put a finger on. Maybe it’s the paint color that makes the car stand out—it does look like a Japanese soldier’s WWII uniform. There’s also a very Kanjo racer vibe, just like with those EF- and EG-body Civics that you see ripping it on the highways of Osaka on YouTube. This is probably what makes Makino so alluring and mysterious. His favorite details are the rally clocks that were bought from Russia and are meant for military use. Jeiven loves the small accessories that somehow fit with the personality of the car. Finding these bits and pieces is what makes him happy. The vintage Celica fender mirrors are another cool detail. 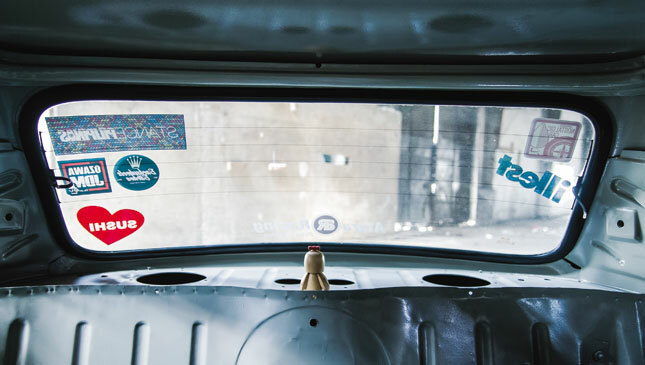 A custom passenger seat was built to fit the interior, too—a DIY copy of the original Bride seat for the driver. This is a one-of-a-kind ride that stays true to old-school roots and draws inspiration from East and West. At times it is hard to understand, but that’s how it is with works of art born from genius. All you have to do is take a step back and appreciate what’s in front of you—then it will all make sense. 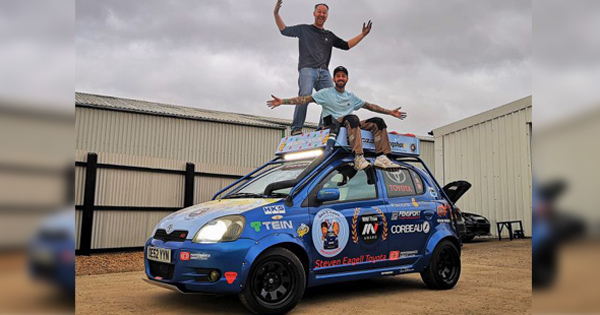 NOTE: This article first appeared in Top Gear magazine's April 2015 issue.